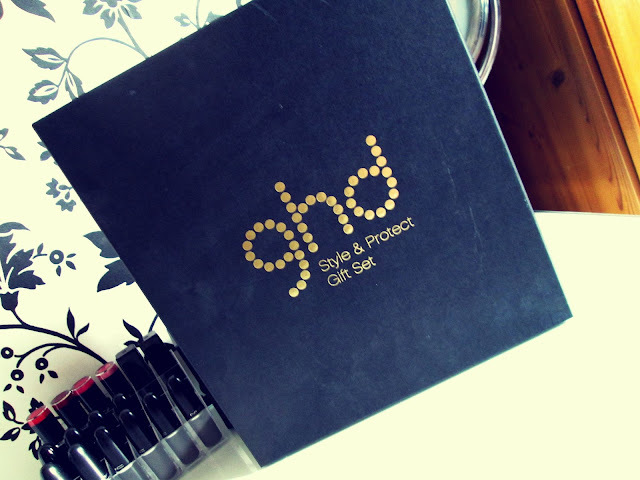 ghd are one of the top brands when it comes to hair care so when they kindly offered to gift me a ghd Style & Protect Gift Set to review I jumped at the chance as I'd never tried any of their product before apart from having my hair straightened at the hairdressers. I have enjoyed using these products so now I'm now going to share my thoughts about the contents of the gift set. Straight hair is my go to style when I use heat so I am always more than happy to add any product that helps along the way to my collection. ghd Straight & Smooth Spray is a spray that you use on wet hair to help smooth and straighten your hair while eliminating frizz that can sometimes be caused by blow drying. 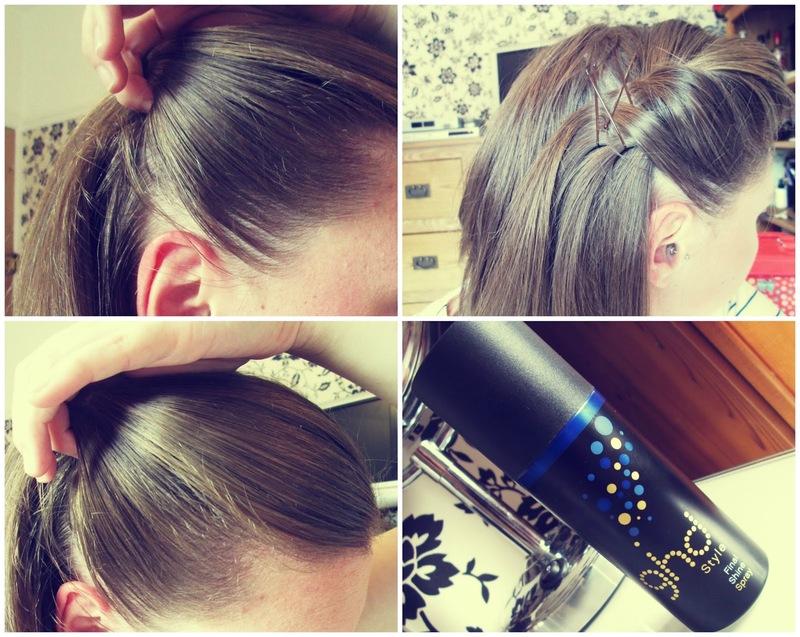 The amazing thing about this product is that unlike a lot of others, it is a heat protection as well as a straightening spray as it contains the ghd Heat Protection System. This is brilliant in my opinion as I hate overloading my hair with too many products and hate the feeling of product build up. 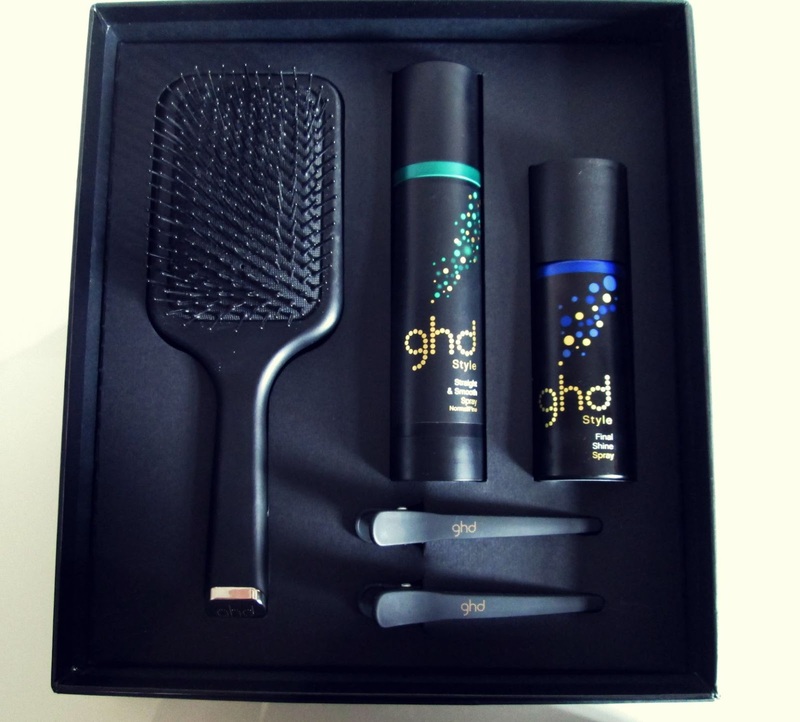 The spray has the signature ghd scent and is packaged in sleek a sleek black tube with a green ring near the top as ghd colour code each section of their hair care products. The spray itself helps to blow dry your hair straight and straighten it which cuts down the amount of time you use heat on your hair and also makes the styling last a lot longer than it normally would. As I have oily hair, shine sprays, serums and oil is something I've always avoided in the past but since I've started to look after my hair properly this has all changed and I can now appreciate the benefits that these products have to offer. ghd Final Shine Spray is a lightweight spray that adds shine to your hair and also smooths flyaways and helps to keep them in place. The smell of this product is again the signature ghd scent, it's packaged very sleek like the rest of the range and is part of the blue labelled range. ghd Final Shine Spray is the first shine spray I have ever tried and has surprised me by being my favorite from the gift box. To use you need to spray a small amount on your styled hair and leave it to sink in for a few seconds for an instant healthy shine. You can also brush your hair through to distribute it but that's really personal preference. The shine this product creates has left me really impressed, it's amazing for bringing out natural highlights in your hair and leaves it looking healthy as well as shiny. I'm the type of person who always thought a brush was a brush but I was completely wrong. After using a vary of other brushes I can now (thankfully) tell the difference between a quality brush and a brush that rips your hair out and gets tangled in a blow drying mission. The ghd Paddle Brush is an exceptional quality brush that glides through your hair and gently detangles any knots with out damaging and leaves your hair with a healthy shine. This brush blows any others I have tried out of the water and I would honestly recommend this brush from now on to anyone who will listen haha. Another product I never bothered with before and always wondered why my hair would never stay straight comes in the form of sectioning clips. Sectioning clips make a significant difference to the end result when straightening your hair as straightening in sections ensures all hair is straightened properly. ghd Sectioning Clips hold hair in place without moving regardless of the amount in the clip and don't pinch, stab or fall out which has happened with most of other clips I have used in the past. They ensure that all hair is secure and most importantly do not snag or snap any hair in the process. As well as reviewing the products I was also asked to create a speedy summer hair tutorial, as I'm not the best at hair I've kept this as simple as I could for everyone who shares my frustration at styling their own hair. 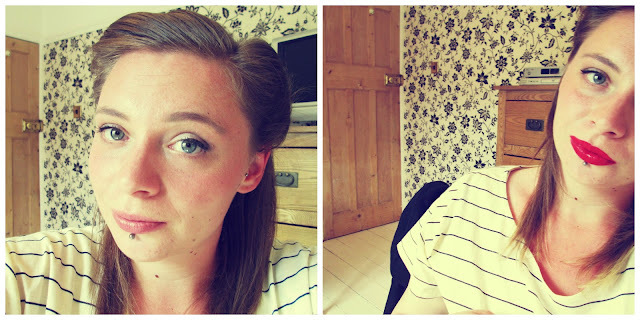 The tutorial is 1940's/1950's inspired that creates a faux Victory Rolls (I applaud anyone who can create Victory Rolls in their own hair) type of hairstyle that keeps your fringe and the front of your hair out of your face on hot and sticky summer days. 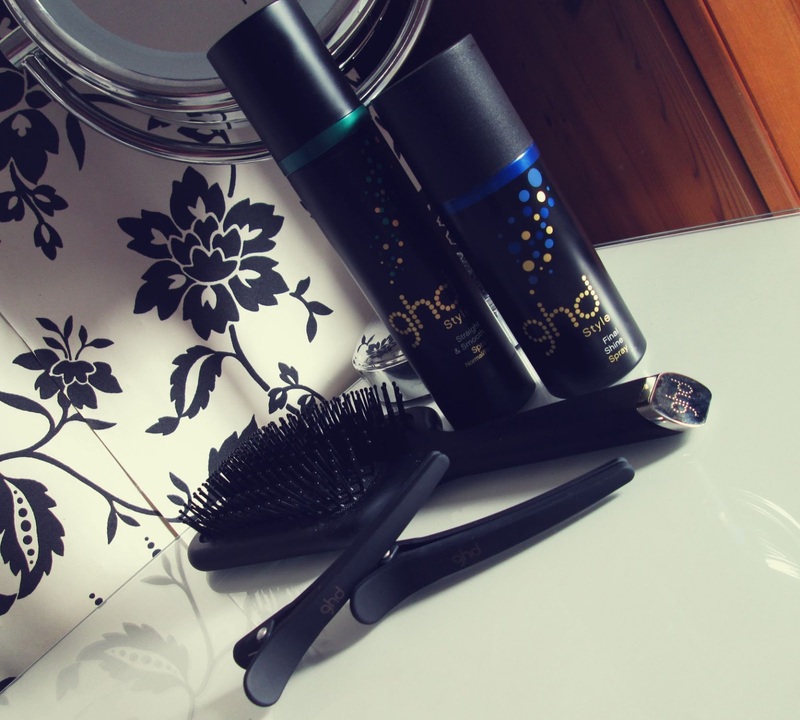 Wash your hair, apply ghd Straight & Smooth Spray and blow dry straight. Section your hair in as many sections needed, spray again with the Straight & Smooth Spray as this helps with straightening as well as protecting your hair. Continue sectioning, spraying and straightening your hair until you have completed all of your hair. 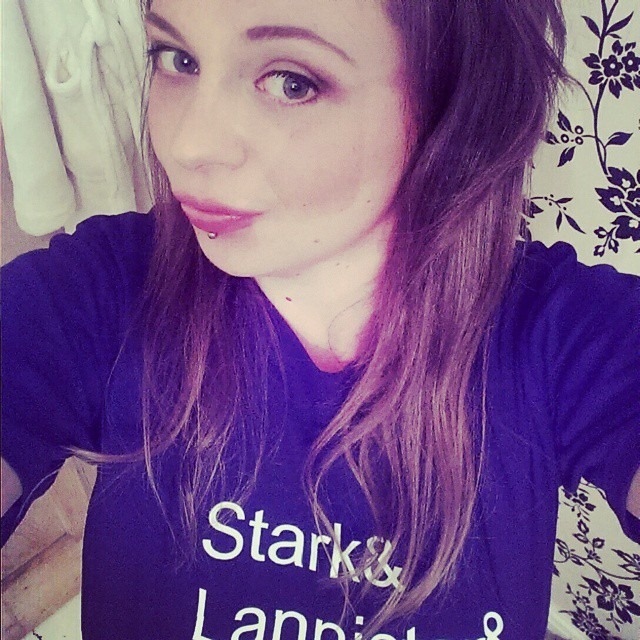 As you can see from the picture I leave the ends of my hair till the end as my hair works better that way. Section your hair in to a side parting and brush your hair so there are no bumps or lumps. Yes, that picture is me with a comb over. Taking the smallest section of the two, section your hair/fringe in to a small amount of hair that is big enough to create a side quiff. I normally take from the front to the ear. Smooth this hair out and place it where you would like the quiff to be then simply twist one or two times, gently push the hair forward slightly then secure it with clips/bobby pins. Your hair should now look something like this on the one side. Check the clips/bobby pins are where you would like them or make them look neater if you wish. Step seven is repeating step five. Take the bigger section of your fringe/hair and smooth it out and create a side quiff. This step needs a bit more care as it's a bigger section of hair. Gently place the hair where you would like it and twist again, two or three times then secure with clips/bobby pins. I like the bigger piece of hair to create a bigger quiff than the smaller side as I think it looks better, this is optional to your personal preference. 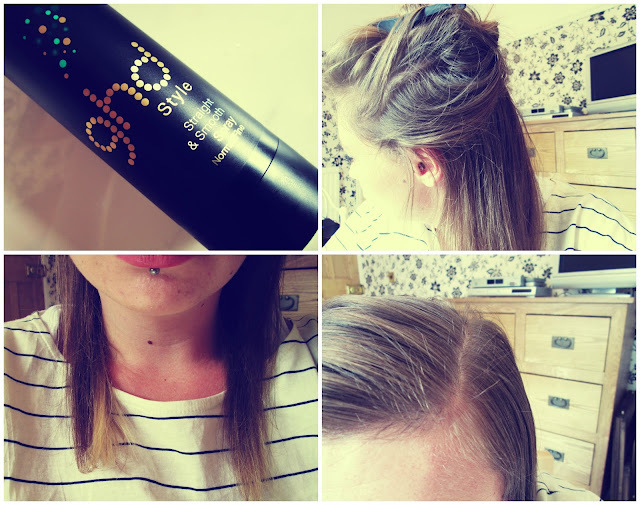 Straighten the ends of your hair if you leave them till last like myself and spray a small amount of the ghd Final Shine Spray to give your hair a shiny, glossy finish. Love your hair, it looks fab!